On campus interviewing is a great strategy for screening candidates or doing first-round interviews in a convenient location for students. It’s also a great way to maximize your time on campus if you are already traveling here for a career fair or other recruiting event. 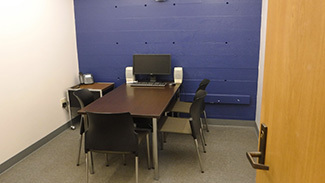 Career Services has access to several interview spaces on campus, all of which are available at no cost. Complimentary wifi access is also provided. 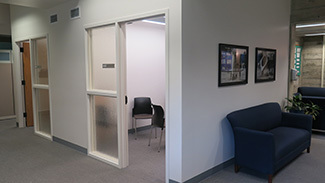 Located in close proximity to interview spaces are a small reception area, restrooms and an employer/staff kitchen area with access to water/tea/coffee. Parks Hall There are 5 additional interview spaces available in Parks Hall. Three spaces are on the ground floor and (pictures below) can comfortably accommodate 2-3 people. 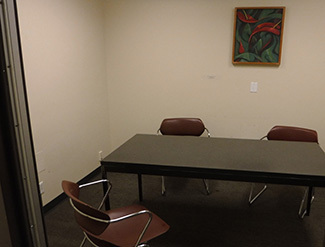 Two spaces are on the third floor and can comfortably accommodate up to 6-7 people if needed in a small conference room setting. Advanced reservation of space(s) is required, and employers are encouraged to submit requests utilizing their account in Viking Career Link. Accomplish this in just a few steps! 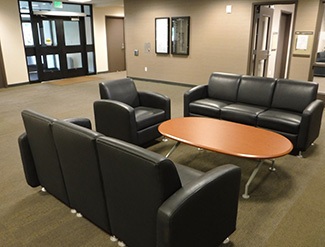 Submit your request as a room reservation only, or a customized schedule known as “On Campus Recruiting” where an employer can accept and review applications electronically and then invite candidates to select an interview timeslot. When in doubt, please don’t hesitate to contact us at careers@wwu.edu or (360)650-2944.